Parisian developer Novaquark have hired Hrafnkell Oskarsson, one of the original designers of Eve Online, to help work on their dizzyingly-ambitious spacefaring MMO Dual Universe. Excited for Dual Universe? Check out our list of the best MMOs you can play while you wait. Dual Universe, like Eve, is being designed to be a vast universe where players determine most of what happens in it, and Oskarsson’s experience with CCP is clearly well-suited to this kind of project. AFJV reports(French language) that the projects share a common legacy, and that Oskarsson and Novaquark want to make a persistent, single-instance universe on a scale never before seen. And Dual Universe is indeed almost boundless in scope. PCGamesN’s Matt talked with Novaquark’s founder and president in 2016 about the game, and came away fairly stunned by what he had seen of the game, which lets players take on just about any role they can imagine and build anything they can come up with the resources for, from space stations to stargates. 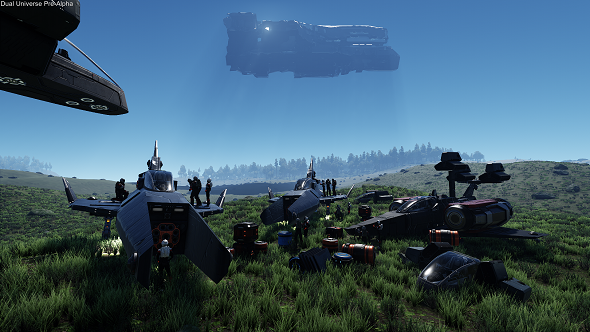 You can find out more about Dual Universe at the official site.